Many times we have to change our Whatsapp number or change the smartphone. Sometimes our personal data gets deleted because of changing the number of Whatsapp or changing the smartphone. A feature has been added in Whatsapp in 2017 which prevents you from deleting your personal data. With this feature of Whatsapp you can save your Whatsapp data. But for that you have to use the same smartphone. Today we are going to tell you the easiest steps to change whatsapp number without losing data. Step 1. First of all you go to your Whatsapp. Step 2. After that you will see three dots on top. You tap on these dots. Step 3. Tap on dots, you see a lot of options, tap on the settings of these. Step 4. After taping on the settings you will see the option of the account. Step 5. After you tap on the accounts, you have to tap ‘Change number’. Step 6. You will see two tabs after changing the change number. In the first tab you will have to enter the old Whatsapp number, which you are using. Step 7. In the second tab you will have to enter the new Whatsapp number, which you want to use. Step 8. After this, the verification process will be completed after tapping on Done. Step 9. Once your verification is complete, your number will change and your data will also be saved. 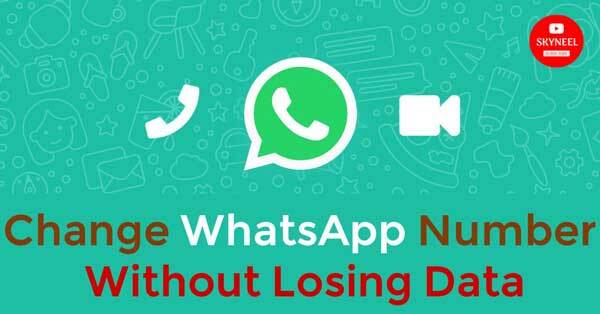 In this article we have told you about change whatsapp number without losing data. If you liked this article then you can also like our Facebook page and subscribe to our YouTube channel too. If you have any problem related to this article, you can comment and tell us.